This very day. This very hour. The citizens of Cape Town face a draught that threatens the whole city. is expected to be on the 11th of May. Was there no prior knowledge that warned of the crisis beforehand? Of course there was. One thing is access to knowledge, how it informs decision-making and political action is something different. why we need to talk about the science-policy interface. on the United Nations Sustainable Development Goals – the SDGs. how important our knowledge – based on research – is for the SDGs to succeed. and more ambitious than the previous Millenium goals. The responsibility is now global. that means the perspective of developed and developing countries is challenged. In the context of the SDGs we are all developing countries. wrote a letter to all Deans, Universities presidents and leaders of higher education institutions around the world. or lose from the success or failure of the Agenda. Why did Thomson address us? and to make our knowledge and research available. Because it is decisive that we are listened to in the process of diplomacy making. because we realise that knowledge shapes society. 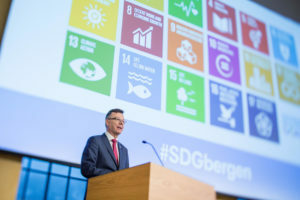 In Bergen we work strategically with the SDGs. Just last month we established the Centre for Sustainable Global Ocean Governance and Research. we have created a mechanism for providing research-based knowledge supporting informed policy-making. Such collaboration will help Norway be a key international player on the SDG14 – “Life below water”. we progress towards conserving and sustaining the oceans, seas and marine resources. Sustainable management is also critical to the blue exonomy and thus SDG2 – “Zero hunger”. 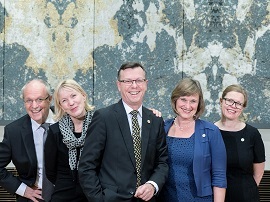 Our university agreed to several voluntary commitments devoted to sustainable oceans. we need to build partnerships and cooperation globally. Climate change is the greatest threat to human rights in the 21st century. These are the words of Mary Robinson – former President of Ireland and United Nations High Commisioner for Human Rights – referring to SDG13. But, it also affects a number of the other SDGs, like sustainable cities and communitites, zero hunger, good health and clean water. The Paris agreement, COP21, represented a breakthrough for combatting climate change. It was also a victory for high level diplomacy. International diplomacy and negotiations on topics of global importance. This show the mutual dependence of scientific quality and societal relevance. Centre for women’s and gender research, – goal five, Gender Equality. Centre for international health – goal three, Good Health and Well-being. Centre for climate and energy transformation, CET – goal seven, Affordable and clean energy. we study human lives, economies and societies, – Subjects subsumed in every goal. A common grounding of all the sustainable development goals is that we – humans – are the key to succeeding. Subjects in humanities and social sciences are common for all SDGs. humanistic and social understandings are more important than ever. It also implies that we must think differently. Business as usual is no option. We must be critical AND creative, we need to embrace diversity in view and ideas. Our students are our inspiration. They prove that creation, refinement and dissemination of knowledge and awareness work. Through these processes, our efforts really do make an impact. We must work with our students so they can shape our common future into a sustainable one. Before wells began to dry up in Cape Town, there were forewarnings. conflict and crisis on a global scale. Knowledge is the prerequisite for tackling these challenges. Welcome to this conference on the UNs sustainable goals. An event we promise to make an annual arena for discussions over the SDGs and to foster the science-policy interface. Now, it is my great pleasure to introduce the minister of research and higher education, Iselin Nybø. The floor is yours!